The first session of the Forum on Human Rights, Democracy and the Rule of Law focused on the role of youth in public-decision making. The Forum was established by the Human Rights Council (HRC) through resolution 28/14, adopted on 26 March 2015. The purpose of the Forum is “to provide a platform for promoting dialogue and cooperation on issues pertaining to the relationship between these areas” and to “identify and analyze best practices, challenges and opportunities for States in their efforts to secure respect for human rights, democracy and the rule of law”. The resolution also stated that the theme of the first session would be “Widening the Democratic Space: the role of youth in public decision-making”. The Forum was co-chaired by Mr. Ahmad Alhendawi, UN Secretary-General’s Envoy on Youth, and H.E. Ambassador Daniiar Mukashev, Permanent Representative of the Kyrgyz Republic to the UN. 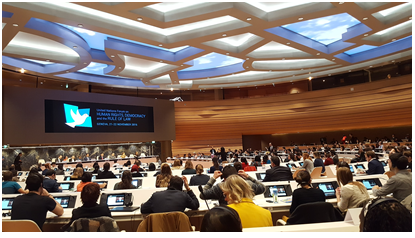 The Forum took place on 21-22 November 2016 in La Salle des Emirats (Room XVII) at Palais des Nations. Over the course of two days, four panel discussions took place at the Forum, which was greatly attended by youth delegates from various nations and organizations. The first day focused on the structures, frameworks, and mechanisms that enable effective participation of youth. On the second day, panelists spoke about youth participation in promoting the 2030 Sustainable Development Agenda and other human rights issues. The final panel discussion discussed how youth can move the global youth agenda forward. With half the population in the world under 30, it is a large force of people that should play a larger part in the decision-making structures of international and national organizations. UN Security Council Resolution 2250 (December 2015) on Youth, Peace and Security recognized the need to integrate more youth in peace-building and dispute-resolution processes. The topic of youth and human rights was also recently presented at a panel discussion in the 33rd session of the HRC this past September (see VIDES’ contribution to the panel here), thus demonstrating the importance that the UN has placed on the topic. However, as mentioned by UN High Commissioner of Human Rights Mr. Zeid Ra’ad Al Hussein in his opening statement, more youth need to be included in formal structures. In his opening remarks, Co-chair Alhendawi highlighted some challenges that youth face from effective participation. Ambassador Mukashev, who in his capacity was also representing Member States’ commitment to this Forum, reminded the floor of the Member States’ obligation to support and incorporate youth at national levels which was the subject of UN General Assembly Resolution 68/130 (December 2013). These opening remarks and statements set the stage for some meaningful themes and discussions as well as real life examples of youth making an impact on national policies. One of the key themes discussed during the first day was about changing the social and cultural norms for enabling youth to participate in formal political structures. In a world where many societies are “adult-centric”, youth are dissuaded from engaging with a system that caters more towards adults. In addition, youth are limited from seeking public office due to age limits. However, youth in countries like the U.K. and Turkey have lobbied to lower the candidacy age from 21 to 18 and 30 to 25, respectively. Meanwhile, the Nigerian campaign “#NotTooYoungtoRun” has led efforts to address age discrimination in Nigeria’s legislative and executive branches of government. Despite these efforts though, statistics show a low representation of young parliamentarians worldwide. The second day focused on how youth can make a difference in promoting the Sustainable Development Goals (SDGs). Panelists highlighted the need for awareness, engagement, action and accountability as well as the need for more youth participation in peace negotiation and peace-building efforts. The panel encouraged Forum participants to do their part in returning to their home countries and try to make UN initiatives, such as the SDGs understandable for others. For example, the initiative “Youth For Global Goals” seeks to engage and mobilize young people to promote projects that further the impact of the SDGs in their local communities. The remaining session discussed how youth can be involved in the UN system through youth delegate networks and internship programs. However, there was criticism of youth being invited for “participatory” purposes only and that their recommendations were not being incorporated into UN policy-making decisions. Nevertheless, the Forum co-chairs encouraged the youth participants to continue their participation and stated that they will present the Forum’s findings and recommendations to the 34th Human Rights Council session in March 2017.